Tubes are made of autoclavable polypropylene and are available either individually or in strips of 8 or 12 detachable tubes. Tubes have a gross volume of 1.2 ml but with a cap in place, they will hold 1.1 ml. Caps are made of polyethylene and are not autoclavable. They are available individually and also in strips of 8 or 12. 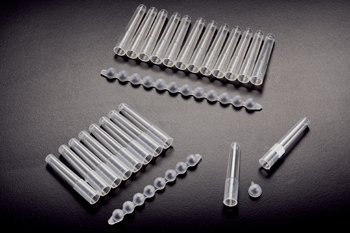 For procedures requiring low surface tension such as protein and nucleic acid work, select a special tube (see T100-20LST) using a type of polypropylene specifically designed to avoid potentially harmful lubricants while minimizing liquid retention. T100-20 can be centrifuged up to 2000g. These tubes are ideal for HTLV-III testing, bacterial and hybridoma cell uptake studies, cell harvesting, pharmaceutical quality control, receptor binding assays, RIA and EIA.